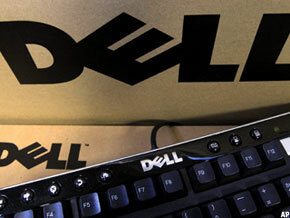 Dell reports its first-quarter results amid concern about the no. 2 PC maker's ability to expand, fend off rivals and cope with economic uncertainty. ROUND ROCK, Tex. ( TheStreet) -- Dell ( DELL reports its first-quarter results after market close Tuesday amid concern about the no. 2 PC maker's ability to expand beyond its traditional business, fend off rivals, and cope with looming economic uncertainty. "We remain concerned that Dell is in a tough fundamental position sandwiched between low-cost players ( Lenovo and Acer) and Apple ( AAPL - Get Report) encroaching more in its core PC business as Macs and mobile devices gain share," explained Shaw Wu, an analyst at Sterne Agee, in a recent note. "Despite efforts to grow beyond a PC company with multiple acquisitions over the past few years, we estimate 70% to 75% of its business is still tied to PCs. This includes peripherals, software, and services." Even after recent deals to acquire data protection specialist SonicWall and virtualization software maker Wyse Technology, Wu warns there's more work ahead. "We still believe Dell needs to take bolder, more aggressive steps to reinvent itself," adds the analyst, who has a neutral rating on Dell. Investors have certainly been underwhelmed by the Texas-based firm recently, pushing the company's stock down more than 12% over the last three months, easily outpacing the Nasdaq's decline of just over 2%. Analysts surveyed by Thomson Reuters expect Dell to report first-quarter revenue of $14.91 billion and earnings of 46 cents a share, compared to $15 billion and earnings of 55 cents a share in the prior year's quarter. The whisper number for Dell's earnings is 46 cents a share, in line with analysts' estimates, according to WhisperNumber.com. Dell has a 46% positive surprise history having topped the whisper in 23 of 50 earnings reports, according to the Web site. Dell, which brought in total revenue of $62.1 billion last year, remains very much a company in transition. Other experts, however, argue that Dell's inherent value is underappreciated by Wall Street, citing, in particular, the company's efforts to bolster its services and enterprise server businesses. During the fourth quarter, Dell grew its services business 12% year-over-year, while its server and networking sales grew 6% over the same period. ISI Group analyst Brian Marshall believes that the most competitive piece of Dell is its enterprise storage business, highlighting the company's successful acquisitions of EqualLogic and Compellent. Dell has been on a mission to reduce its reliance on third-party partners for storage and networking, such as EMC ( EMC and Cisco ( CSCO - Get Report), although Marshall says that it's still relatively early days for this effort. "While this trend is nearing completion in enterprise storage, it is just beginning in networking (for example Dell's Force10 acquisition versus Cisco) and the software and peripherals group," he explained, in a recent note. "We believe changing the composition of a more than $60 billion revenue base is non-trivial and takes years (not quarters) to successfully navigate." Marshall has a neutral rating on Dell. Recent comments from Cisco CEO John Chambers could also weigh heavily on Dell when it reports its first-quarter numbers. The networking giant recently offered up weak fourth-quarter guidance, with Chambers raising concerns about parts of the global economy. Speaking during a conference call, Chambers cited Europe, the public sector and India as areas of weakness. Southern Europe's economic problems, he noted, have spread to northern Europe. "Although we do not expect Dell to sound as concerned about the environment as Cisco did, we would anticipate a conservative tone around the macro environment with optimism around new product initiatives," explained Brian White, an analyst at Topeka Capital Markets, in a recent note. "We believe the Company's analyst meeting on June 12 to 13 will be more telling around business trends and direction for the remainder of the year." White has a hold rating and $15 price target on Dell. Dell shares crept up 2 cents, or 0.14%, to$14.99 on Tuesday. No.1 PC maker and Dell arch-rival HP ( HPQ - Get Report) reports its second-quarter results after market close on Wednesday.